Apple stock has had turbulent fall from it's all time high of $700 per share in September 2012. The share price has continued its decline throughout the first quarter of 2013, in spite of the company announcing record profits in January for q4 2012. Apple is now valued at a trailing P/E multiple of just 7, when adjusting for the net cash position. A simple approach to valuing the company, using a Gordon Growth formula on 2012 Free Cash Flow ($ 41 billion) suggests that in order to justify the current valuation levels, growth must be 5% negative per year to eternity. If you are familiar with this approach, skip to the next section of this article. If you have no idea what I am talking about, read on. where V is the current value of future cash flows to equity adjusted for current cash position, FCF is the current Free Cash Flow to equity, Ke is the cost of equity, and g the expected growth rate. Assuming an expected inflation rate of 2.5%, this is a 7.5% real decline per year. In spite of annualized sales being up 18% year on year in the forth quarter of 2012, earnings per share have decreased (-0.5%), mainly due to gross margin erosion (38.6% vs. 44.7% just one year ago). Corporate guidance is suggesting both lower sales and lower margin for the 2nd quarter of 2013, corresponding to about $ 9.3 billion in net profits (mid-range of guidance), which is a decline of roughly 30% on q2 2012. Apple has a history of under-promising and over-delivering. Though this is a lot easier to do when things are going well, management guidance probably has a buffer baked into the numbers, which are due in the last weeks of April. Though certain analysts (Citygroup, Jeffries) are highlighting there is significant risk that Apple will come short of its own bearish guidance, it may be reasonable to expect actual earnings to be around 5% above corporate guidance. However, it is without a doubt that in addition to sales cannibalization from Android devices, Windows equipped Nokia (NOK), and a revamped BlackBerry (BBRY) hand-set, continued margin erosion is inevitable. Of these three factors, the third is the most ignored and underestimated, and most difficult to control and predict for Apple management. Chinese real wages have almost doubled since 2008 (see below chart, courtesy of Itulip.com). This as a direct consequence of the aggressive quantitative easing policy undertaken by the US Federal Reserve, a gigantic (though now decreasing) US current account deficit vs. China, and the Chinese policy of keeping the yuan in a narrow trading range against the USD. 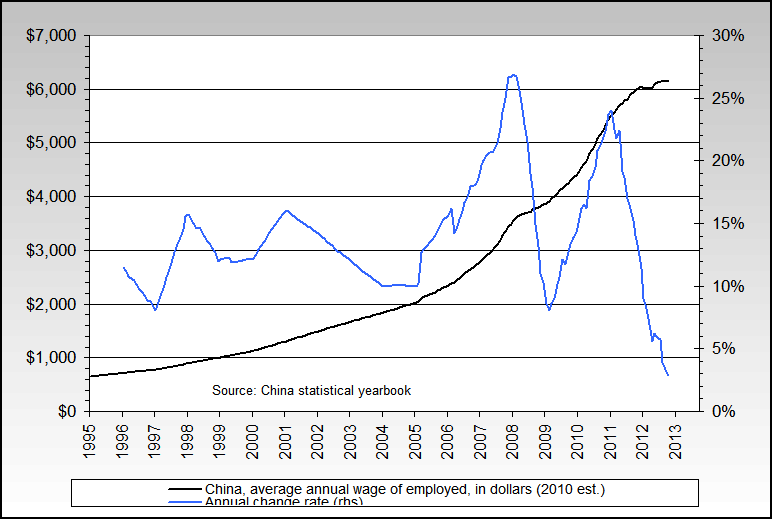 As QE3 is continuing, so will Chinese wage inflation. Foxconn, that manufacturers iPad, iPhone and iPod has over 1.2 million workers in China and is periodically experiencing workers unrest due to demands for higher pay. Earlier this year, reports emerged that Foxconn had halted new hiring at its factories in China. It it worth noting that Foxconn reported record earnings for the 4th quarter of 2012, at $1.21 billion, a 5.6% increase on the previous year, but also that the increase came at the expense of a minor decrease of it's net profit margin (from 3.24% to 3.23%). As Foxconn operates global production facilities, a shift in production over time to lower cost geographies is likely to be expected. Bank of America Merrill Lynch this week estimated that Mexico's labor costs are now 19.6 percent lower than China's. Foxconn has existing operations in Chihuahua City, Guadalajara, Reynosa and Tijuana, which can be used as base locations also to produce Apple products. Though it is possible for Apple to shift production over time to other locations, it is a painfully slow process due to the sheer size of local operations and the complexity of the supply-chain. Besides keeping tight control on the quality of work and components (which requires extensive training of suppliers), a key requirement of the Apple supply chain is to make new products quickly enough after launch to meet consumer demand. Chinese wage inflation will eat Apple's margins, for many years to come.